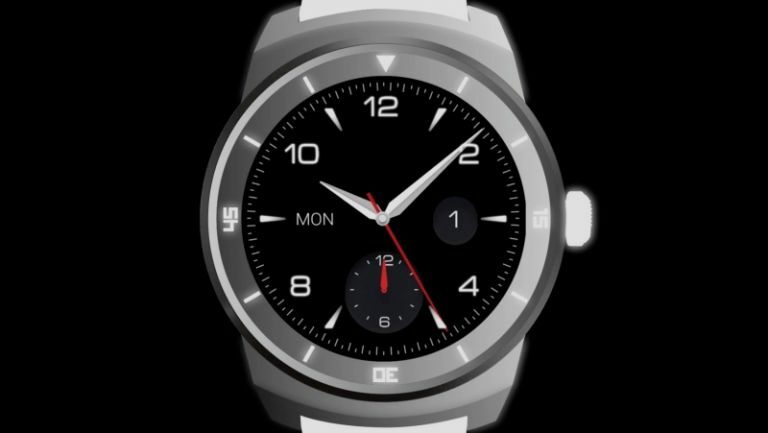 LG's G Watch only landed back in June but the firm's already launching its next wearable, the G Watch R.
Due to be fully unveiled at this year's IFA tradeshow, LG's new timepiece is the world's first smartwatch that features a full circle plastic-OLED display that makes use of 100% of the screen's real estate. LG reckons its 1.3-in P-OLED display produces 'stunning image clarity' even outdoors, and boasts impressive clarity from all viewing angles. Computing heft is provided by a beefy 1.2GHz Snapdragon 400 processor, 512MB of RAM, 4GB of storage, and a hefty 410mAh li-ion battery. These are impressive specs for a smartwatch, trumping the internals of Samsung's Gear S, also revealed today. The G Watch R piggybacks on Google's Android Wear OS, giving it full access to the Google Play Store's raft of wearable-friendly apps. It's also a sturdy fella, touting an ingress protection of IP67 meaning it'll trundle along at a one-metre water depth for up to 30 minutes at a time. "What we've noticed in the year of the wearable is that this is a category that can't be compared to smartphones and tablets," says Dr Jong-seok Park, LG's CEO. "Wearables are also accessories and consumers will want more than one to choose from. So we wanted to complement the modern design of the original G Watch with the classic look of the G Watch R."
The South Korean company says the G Watch R will be available in 'key markets' started in early Q4 this year. Prices and avalaibility will be announced locally at a later date.